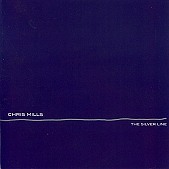 Beautifully crafted, layered pop songs, sparse numbers, and a few high-flying rockers, Chris Mills' The Silver Line is a genuinely solid, delightfully refreshing pop-rock album. One that gives you a glorious number like "Suicide Note", with Kelly Hogan's backing vocals and horns taking the song to a new level, as Mills and company create an uplifting pop background to contrast the lyrics. And then gives you a sparse piano piece like "I Could Not Stand To See You". Relying mainly on Mills' vocals and his piano, but using strings to help the song fully realize its own potential, the result is a treasure that will have the listener melting with the warm tenderness and fragility of Mills and his emotions. And then moments later Mills turns standard bar rock fare into a strong power-pop number that is all heart ("Sleeptalking"). Yes, Chris Mills has created a pop nugget here, an enjoyable collection of friendly, inviting pop songs that take on several emotions and several styles, while sounding distinctively Mills. I'll give it an A-.